The ancient Celts separated the year into two halves, the light half and the dark half, summer and winter. The festival of Samhain, from which the modern holiday of Halloween originates, marks the transition from summer to winter, the end of the Celtic year, a time when the barriers between the physical and spiritual world are at their most transparent. The herbs most characteristic of this time have specific magical and healing properties that echo the darker aspect of the year and offer potent opportunities for divination, contact with ancestors and Land Spirits, and journeys in the Otherworld. 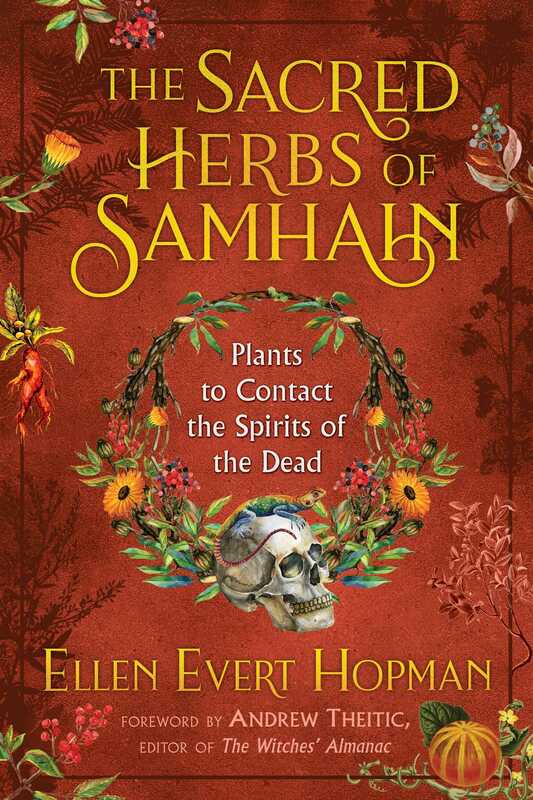 Presenting a practical guide to the sacred herbs and trees of Samhain, Ellen Evert Hopman details the identification, harvest, and use of more than 70 plants and trees in healing, divination, purification, magic, and as tools for contacting the Spirits wandering the landscape at this liminal time of year. She explores the most effective plants for protection from the mischief of the “Good Neighbors,” the Sidhe or Fairies, as well as herbs for releasing the Dead when they are trapped on this plane. Identifying visionary plants used to induce ecstatic trance, Hopman explores how herbs have been used for millennia to aid in psychic travel and shamanic work and shows how one might safely use plants to take a voyage to the Otherworld. Drawing on her knowledge as a master herbalist, she also includes cautions to prevent harm and misidentification, along with advice on basic etiquette and common sense approaches to herb magic. Detailing the history, rites, and traditions of Samhain, Hopman explains how to make an offering to the Land Spirits and provides instructions for the traditional Samhain ritual of the Dumb Supper, complete with recipes for the sacred foods of Samhain, such as Soul Cakes, Colcannon, Boxty bread, and dandelion wine. Woven throughout with mystical tales of folk, Fairy, and sacred herbs, this guide offers each of us practical and magical ways to connect with Nature, the plant kingdom, the Spirits that surround us, and the turning of the year. Samhain is a great “Fire Festival” of the ancient Celts, celebrated at the official close of the harvest. By Samhain all the produce of the fields must be safely gathered into the house and barn and anything left in the fields after this date is the property of the Good Neighbors (the Sidhe) and not to be touched by mortals. It is an old Celtic tradition to leave offerings for the Fairies on this potent Spirit night. Samhain marks the end of the Celtic year and after a three-day observance, the beginning of the next agricultural cycle. Just as a seed begins its existence in the dark of the soil, so does the New Year begin in the dark of winter, which is the time to rest, take stock of the past year’s accomplishments, and dream in future goals. For the ancient Celts there were only two seasons: summer and winter. The festivals of Samhain and Beltaine (May Day) were portals between two spheres of existence, the dark half of the year and the light half of the year, times of chaos when the Otherworld more easily bled through. Samhain, like Beltaine (May Day) was a potent Spirit night, a liminal time when the walls between the worlds were thin and ancestral Spirits roamed the Earth. It was a good time for divination and contact with the Otherworld. According to Celtic tradition the dead come to visit the living at Samhain, especially in the dark of night. A welcome is extended to these wandering dead by leaving a door open, setting an extra plate of food at the table, and by placing an extra seat near the hearth. Candles are lit and placed in windows and doorways to light the way home for departed ancestors. But it is understood that not all these ancestors are happy and that some might come to take revenge for slights inflicted upon them in their previous life. Ghosts are known to seek out and follow those with whom they have a grudge and if one hears footsteps behind them it can be deadly to turn around and look. If you have to be outside it is wise to go in disguise so as not to be recognized by vengeful Spirits. The woodland ground covers known as Lesser and Greater Periwinkle have the same medicinal properties. The herb and flower tea are used for diarrhea, gastritis, heavy menstruation, bleeding between periods and other hemorrhages, and as a gargle for tonsillitis and sore throat. Periwinkle is sedative and beneficial for nervous conditions. The tea is used as a wash for eczema, wounds and inflammations. A poultice of the plants is applied to cramps. Use it in salves for hemorrhoids and for inflammations. *Caution: taking large amounts could harm the kidneys and nervous system, upset digestion, and cause hypertension. Avoid during pregnancy and breast feeding. Periwinkle can cause irritation to the skin in some people. Periwinkle is said to be a charm against “Evil Spirits” and was once made into crowns for dead children. Wear the herb or hang it over the door and on gateposts to repel evil spirits and ill intentioned sorcery. Make a wreath of Periwinkle and hang it on your door. Drape it over gates and windowsills as protection against ill-intentioned Spirits. The ancient Greeks considered this plant to be an aphrodisiac. They also used it to help with insomnia, anxiety, depression and as a general pain remedy. *Caution - Mandrake should not be taken internally more than once a week and larger doses could be fatal. Mandrake contains trance-inducing tropane alkaloids. Ancient Egyptian paintings sometimes show priest-shamans guiding the living and the dead, accompanied by both Mandrake and Sacred Blue Lotus (Nymphaea caerulea). Sacred Blue Lotus is aphrodisiac, euphoriant, slightly mind altering, and helps to alleviate pain. The flowers are brewed as tea or soaked in wine. Mandrake protects against demonic possession and is used in exorcisms. To activate a root first display it prominently in the home for three days then soak it in water overnight. Sprinkle the water on entrances, windows, and people. Left on the mantle it attracts prosperity and happiness to the house. While digging the root avoid touching it because the first person to do so will likely die (This is why dogs were once used to pull it from the Earth). Mandrake roots are used as poppets for good or ill. To make a poppet take a root that looks like a person, decorate it to make it more closely resemble your “target” and then focus blessings or curses on the homunculus. Display a Mandrake root in your home for three days; the day before Samhain, the day of Samhain, and the day after. Then soak it in water overnight and use the water to sprinkle entrances, exits, and windows. Leave the root on display afterwards.